You′re receiving this newsletter because you are registered as a Wingtat Member to receive periodic offers through Wingtat eNews. Sliced Pork & Sliced Lamb: New Additions to Wingtat Sliced Meat Products Organic Free Range Eggs are back in Wingtat Members’ Online Store! Wingtat Sponsors: TVB-Fairchild Fans Party 2017 New Merchant Shop to Wingtat Membership! Spring is arriving! Although snow is still in the weather forecast in March, hopefully warmer temperatures will greet us soon. 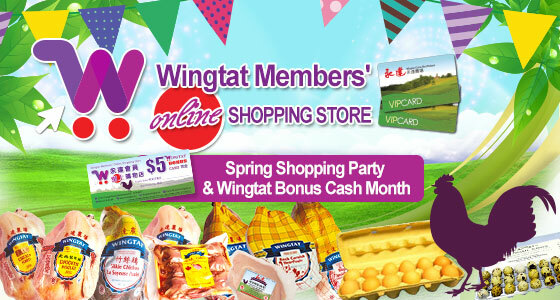 Wingtat will host a Spring Shopping Party for Members in March and it will also be Wingtat Bonus Cash Month! Moreover, there will be Glamorous Spring Lucky Draw! One lucky member will be randomly drawn to win a pair of tickets to「TVB-Fairchild Fans Party Show 2017」. 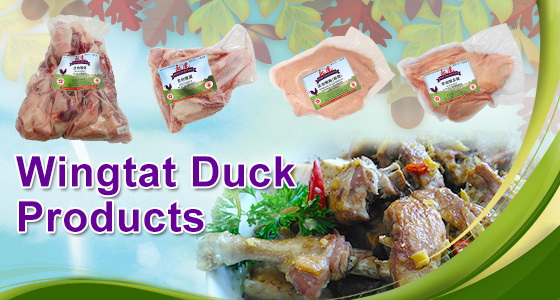 Wingtat Young Duck Products & Sliced Meats (with Sliced Pork and Sliced Lamb newly added to collection) & Organic Free Range Eggs are now available on Wingtat Members’ Online Store. This month Wingtat Kitchen is recommending two recipes to welcome Spring! Mijune Pak of Follow Me Foodies introduces B.C. Silkie Chicken in World of Flavours! B.C. 's Specialty Asian Poultry, Silkie Chicken and Taiwanese Chicken, is supported by the Government of B.C. 's Buy Local Program. The new episodes of Wingtat sponsored “Welcome Year of the Gold Rooster” Radio Game Segment on AM1320 are now available for Members to listen to! In addition, 「TVB-Fairchild Fans Party」 is back this April in Vancouver and Wingtat is Gold Sponsor! This month, your friends and family can register as New Member and receive $5 Wingtat Bonus Cash as Welcome Gift. Lastly, a reminder to our fans in Hong Kong, a great selection of Wingtat Products are being sold at Yata Supermarkets in Hong Kong. 1. Order Start Date: Friday, Mar 3rd. 2. Order Deadline: Sunday, Mar 26th. To compliment the beautiful arrival of cherry blossoms season in Greater Vancouver, Wingtat will be having「Members' Glamorous Spring Lucky Draw」. One lucky member will be randomly drawn to win a pair of tickets to 「TVB-Fairchild Fans Party Show 2017」. With every $50 of products ordered from Wingtat Members′ Online Shopping Store in March, Members will receive one automatic entry into the lucky draw. Place your order online and be entered into the lucky draw by Sunday, March 26th, 11:59 pm (PST). Draw date is Monday, March 27th. The lucky Member will be notified by phone and will receive the prize on Thursday, March 30th, the same day Members pick up their order. Good news! Non-Members can participate in our online shopping party as well! Please click here for more information. First Place: The honourable position of first place for the month of January will remain the same: Wingtat Silkie Chicken. Our Silkie Chicken is popular as eating Silkie can help improve beauty, health and blood circulation. It also strengthens and restores vital energy, treats disorders of the liver, relieves sickness, eliminates fatigue, relieves menstruation symptoms etc. Please note that lately there is wider selection of Silkie Chicken available for consumers to purchase at supermarkets. We would like to remind our loyal consumers that our company is a federal establishment and all our poultry is inspected by the inspectors of Canada Food Inspection Agency. Our Wingtat Silkie is of purest breed and is deep purple black in skin colour. When you purchase our Wingtat branded Silkie Chicken, you are buying the assurance of quality and food safety. Second Place: After months of being top product, Wingtat Loong Kong Chicken running close to the Wingtat Silkie Chicken this month. 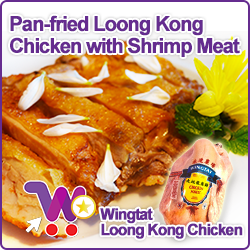 All Wingtat Free Run Loong Kong Chicken is raised in healthy and natural environment of Wingtat′s Farms in British Columbia. Because of its thicker meat and layer of fat beneath the skin, it is ideal for deep-frying and roasting, which gives you a gorgeous golden color. Third Place: Claiming third is our Wingtat Canada Chicken. Wingtat Canada Chicken is ideal for grilling, baking and roasting. Under appropriate baking temperature, its small amount of fat beneath the chicken skin will melt into the chicken meat and make it more tender. Wingtat Free Run Canada Chicken is naturally fed, so it's delicious taste is uncomparable with regular chicken in the market. After brushing the chicken skin with vinegar, hang the chicken to dry. This will enhance the crispy texture of the chicken. For more information about our online store, click here. Wingtat 2017 TV commercial [🎶 Chicken…All is Chicken…🎶 ]. 2017 is Wingtat’s Year! Wishing you and your family a prosperous Year of the Gold Rooster. Wingtat Young Ducks live in large spaced environments, feeding on natural food, though slightly smaller in the size, they have less fat and more nutrition, with extremely delicious taste. Wingtat Young Duck Products are great choices for cooking and making soups. Here are a few recommended recipes for Wingtat Duck Products. $30/combo (save $5 if you buy the combo). Our new packaging for Wingtat Sliced Meats uses a deep sealed tray. On the label, Wingtat has also included Nutritional Fact Table for consumers' reference. Members can now order Wingtat Sliced Meats via our Wingtat Members' Online Store. It is sold by set of 4 packs of sliced meats. (Note: Each pack now contains minimum 220g of meat.) Wingtat Members’ Price: $ 25 /1set, for $ 45/2 sets (save $ 5), $65 /3 sets (save $ 10). 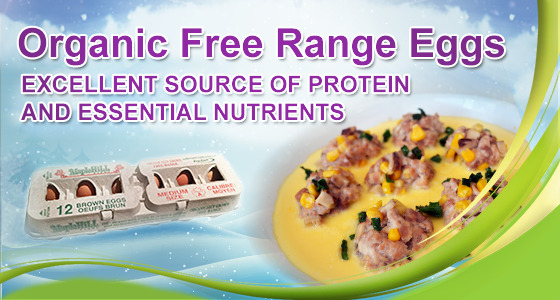 Maple Hill Organic Free Range Eggs are an excellent source of protein. The eggs contain more than 11 essential nutrients and 15 major vitamins and minerals (vitamins A, B12, B6, D, E) and Riboflavin, folic acid and iron. Egg yolk contains carotenoids, which help to protect eyesight. 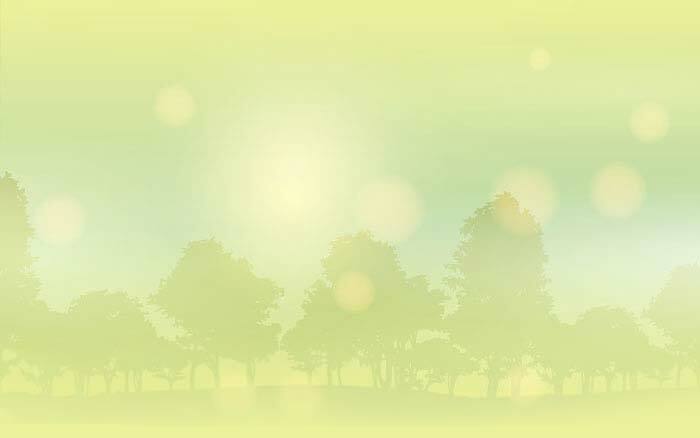 Maple Hill Organic Free Range Eggs are certified by a Canadian organic certification agency. Organic eggs are produced from hens that have been given certified organic feed in which all of the ingredients were grown without the aid of commercial fertilizers, pesticides, or herbicides. This makes the cost of production more expensive which makes the price of organic eggs higher than non-organic. Free range chickens roam freely outdoors during the daytime. The shell of our free range eggs is brown in colour. The color of the egg's shell is simply an indicator of the breed of hen that laid the egg. Breeds with white feathers and ear lobes lay white eggs. Hens with red feathers and ear lobes lay brown eggs. There is no nutritional difference between white and brown eggs. Members can now order Maple Hill Organic Free Range Eggs via our Wingtat Members' Online Store. It is sold by set of 5 boxes. Each box contains 12 eggs. Wingtat Members’ Price: $ 20 /1set. If you want to know more information, please click the link: maplehillfarms.ca. The Loong Kong chicken is well-known for its juicy, tender and flavorful meat, as well as the yellowish chicken fat under its skin, which makes it an ideal ingredient for pan-frying. Minced shrimp meat is a typical ingredient in Cantonese cuisine. Perfect minced shrimp meat requires a mix of fresh and dry shrimps with completely dry knife and cutting board. The shrimp meat must be stirred in the same direction. Stuffed with minced shrimp meat, the pan-fried Loong Kong chicken is golden brown and crispy on the outside and juicy on the inside, suitable for children and the elderly alike. This recipe is perfect for kids to enjoy during Spring break. The "one pot and two small dishes" tradition is enjoyed and praised by many as a relaxing pastime. It refers to a pot of good Chinese tea and two dishes of dimsum. 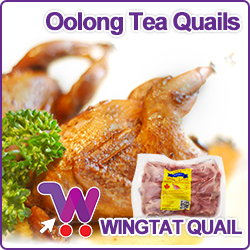 Oolong Tea Quails is a dish that could be enjoyed as a dimsum; the fragrance of Chinese tea is absorbed into the quails inside out during the cooking process. It captivates our senses with the unique and delightful scent, and removes the feeling of grease. Lastly, the oolong tea also coats the quails beautifully; here is a dish that looks good, smells good and taste amazing! 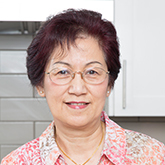 Every other week on Wednesday morning after Kitchen Talk at 10:30am, Mrs.Chiu will co-host Wingtat's "Welcome Year of the Gold Rooster" Radio Program and Game Segment. She will talk about Wingtat's new products and play Q&A game. Be sure to listen to the program and be ready to call 604-280-1320. The first two participants to call in and answer the questions correctly will receive prizes. The last segment will be broadcasted on March 15th, 2017. "Welcome Year of the Gold Rooster" Program and Game segment is sponsored by Wingtat Game Bird Packers. Mijune Pak of Follow Me Foodie demonstrates a Chinese recipe featuring Silkie Chicken raised in B.C. Wingtat is acknowledged as one of the few companies who raises and supplies B.C. Silkie Chicken to supermarkets and restaurants. Special thanks to B.C. Chicken Marketing Board for presenting the video. B.C. 's Specialty Asian Poultry, Silkie Chicken and Taiwanese Chicken, is supported by the Government of B.C. 's Buy Local Program and Investment Agriculture Foundation of BC. Now is a great time to invite your families and friends to join Wingtat. The Wingtat Membership has existed for more than 9 years now, partnering with more than 75 different membership Merchant Partners and having an increasing family of 8000+ Members! Every year, we welcome more and more new members to join our big family, and enjoy exclusive Members' offers. 1. Place your first order on Wingtat Online Store and become Wingtat Member at the same time. Before clicking the Submit button on the online ordering form, remember to enter " “NEW MEMBER” in the space provided for Membership Number. On the same day that you pick up your order at Wingtat, New Members will be required to complete the Membership Registration Form and the one-time registration fee of $25 (cash) will be collected. Upon registration, New Members will receive their Wingtat Membership Card. 2. 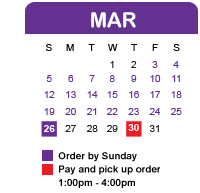 Should you not wish to place an online order at this time, please register in person at Wingtat Office. (11951 Forge Place, Richmond, BC) Upon completing the Membership Registration Form and paying the one-time registration fee of $25 (cash), New Members will receive their Wingtat Membership Card. LIMITED TIME OFFER: Receive $5 Wingtat Bonus Cash upon registration as a Wingtat Member. Offer valid until end of April. If you have any questions, please feel free to call Wingtat office at 604-278-4450 for more information. 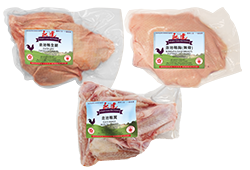 Wingtat Products are not only popular among American and Canadian consumers, there is also a high demand for our fine quality Wingtat Poultry Products in Hong Kong. A great selection of Wingtat Canada Poultry Products (including Taiwanese Chicken, Silkie Chicken, Partridge, Quail, etc.) are now available for purchase at Yata Supermarket locations in Hong Kong. Yata Supermarket brings to the town a brand new Japanese ‒ style supermarket originated from its philosophy of “Enjoying the excitement of Modern Japanese lifestyle”. From store decoration to merchandise selections, each store is just unique to suit the local taste. Gourmet from Japan and all over the world freshly arrives everyday, special food promotions and food stalls showcases the trend in town and the best in taste. 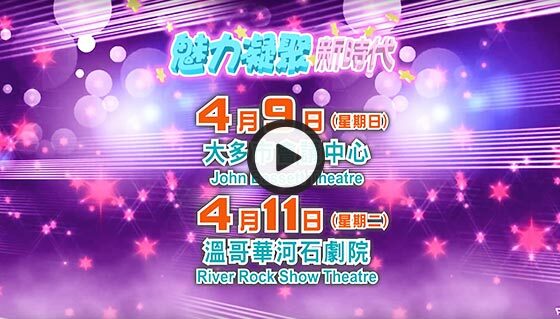 The Wingtat-sponsored, ever popular TVB-Fairchild Fans Party is going to be back this Spring on April 11, 2017 (Tuesday) at River Rock Show Theatre, bringing you a memorable evening filled with great entertainment, superb musical performances and games with fabulous prizes that you don’t want to miss. Four popular TVB artistes including 林夏薇 Rosina Lin, 陳凱琳 Grace Chan,黃智賢 Ben Wong and 黃浩然 Raymond Wong will definitely dazzle the show with their vibrant and outstanding performances. Hope Health Enterprise provides traditional Chinese medical treatment for various kinds of pain and illness. We accept MSP, ICBC, WCB and personal insurance. Wingtat Members can enjoy free ear acupoint treatment 3 times ($40 value) upon purchase of 10 treatments.